Chelsea midfielder Frank Lampard has not rejected a contract offer - because no talks have taken place about a new deal, according to his agent. Lampard was reported to have rejected the Blues, but Steve Kutner says he, Lampard and chief executive Peter Kenyon have not sat down to discuss it. "The three of us haven't had chance to talk," said Kutner. "But nothing has changed - Frank wants to stay." Lampard, 29, has two years left on his current deal at Stamford Bridge. Kutner says a deal will be thrashed out when Lampard returns from holiday for pre-season. "There has never been a time when the three of us have been free as Frank has been on holiday and Peter has been away," added Kutner. "But Frank will join up with Chelsea's tour next week and will be as committed as ever. "Nothing can get sorted out until he gets back, but there is no rush." 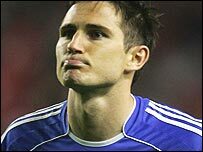 Sunday's News of the World claimed the Blues were willing to make Lampard the top earner at Stamford Bridge. The newspaper says the deal would have eclipsed the £121,000 a week given to Andriy Shevchenko and Michael Ballack. England midfielder Lampard, 29, has two years left on his current contract and said last week he was content to see out that period of time at the club. "They don't have to offer me anything so I'll just carry on," he stated. However, Lampard added last month that he would have liked the club to have offered any such new deal in early June. "In an ideal world, it would have happened three weeks ago but it is not an ideal world," said the Blues star. Under Fifa rules, Lampard can buy out the remainder of his contract but it was reported in February that he was unlikely to take that course of action. The £15m-rated player has been linked to Barcelona and Juventus, who are now managed by former Chelsea boss Claudio Ranieri. Lampard enjoyed his most prolific season in front of goal for the Blues in the 2006-2007 campaign, scoring 21 times.